with vegan chocolate coconut ganache. This recipe was for Adam’s birthday cake! An invention based on a chocolate version of the white coconut cake recipe I posted recently. It’s a double recipe, so would fill two 8 inch cake pans for a nice tall double layer cake (make extra ganache if that’s your plan!). 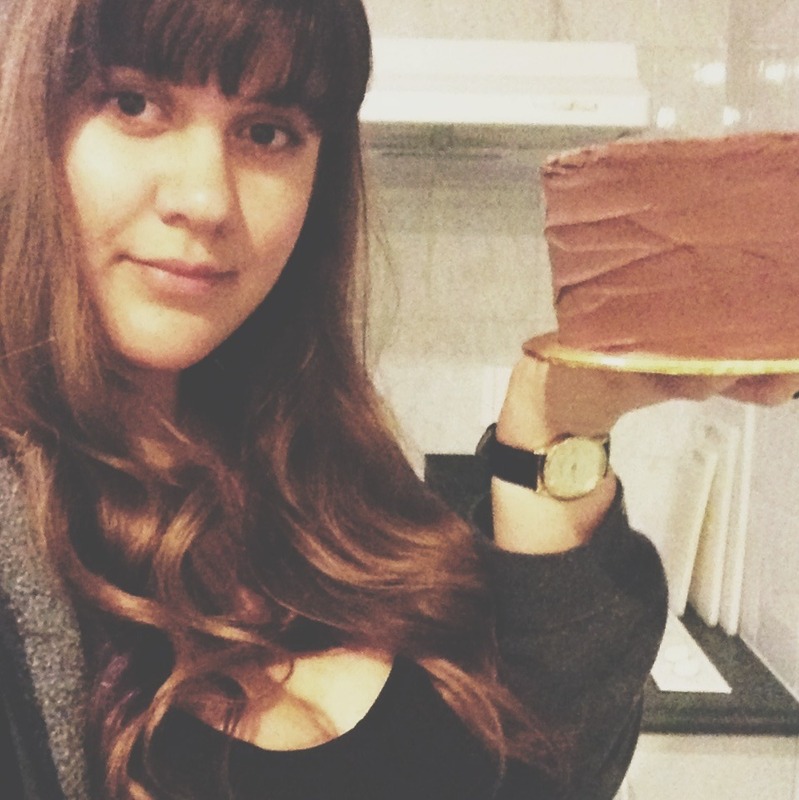 I used a tall 5 inch pan for a little but high cake coated in ganache that more than served our table of 12. Preheat oven to 170°C, line and grease two 8" round cake tins (or one tall 5" one!). Combine the milk and apple cider vinegar, set aside and allow to curdle. Sift together the flours, cocoa, guar gum, cocoa, baking soda, baking powder and salt. Add the desiccated coconut to this dry mixture. Melt the chocolate in a med-large mixing bowl which will eventually contain all ingredients. Add the oil to the melted chocolate, stir through, then add the extracts of vanilla and coconut. Ideally, the milk and apple cider vinegar combination should have been left to stand for around ten minutes and should be close to room temperature (or at least not cold). Add half of the milk mixture to the chocolate and mix together, then add the other half. Next add the sugars to the wet mix and stir thoroughly. Add a third of the dry ingredients, fold into the wet. Add half of the remaining dry ingredients, fold in, and then add the remaining dry mix to complete the batter. It will be slightly lumpy. Pour into the prepared cake tin(s) and bake for about 45-50 min or until a skewer inserted into the middle comes out clean. Or clean ish – it is a gooey fudge cake after all. Rest the cake(s) in their tin(s) for 10 min on a cooling rack before turning out to cool completely. At this point you can put the cake in a plastic bag and freeze it, or put it in the fridge for a day or two before icing it. I used a bar of Green & Blacks Organic Dark 70%, and roughly 50% of the solids from a 400mL tin of “Family Choice” brand coconut cream. Tip – when buying coconut cream – shake the tin, if the contents move about a lot in there, don’t buy it. You want the practically solid stuff. The thicker, heavier and creamier, the better for this job. Before opening the tin for making this recipe don’t shake it! You want the insides to stay separated so you can scoop the “heavy” cream off the top of the tin. I didn’t add sweetener to the ganache as the cake itself is quite sweet and the velvety texture is a nice complement to the cake without it’s own sweetness. The coconut flavour doesn’t actually come out as the chocolate masks it, you could add coconut essence or another flavouring though. Break up the chocolate and melt it down in a double boiler, taking extra care not to get any water or steam in the chocolate. Add the coconut cream, vanilla, and stir until combined and smooth, then remove from heat. I put mine in the freezer to cool, and stirred it intermittently until it was a nice thick consistency to spread over the cake with my usual offset spatula that I use for buttercream.